One of two colorful fresco fragments (see also 83.AG.222.4.2) that once decorated the same wall. An old Silenus—a woodland deity and companion of the wine god Bacchus—stands within a leafy arbor. A reddish cloth rests on his hips, covering his upper legs. He holds a kantharos (drinking cup) and a thyrsos (ritual staff), objects associated with the worship of Bacchus. Below the Silenus is an impressionistic landscape on blue ground that depicts human silhouettes set among architectural elements. Two figures in a boat navigate towards a central figure standing in front of a building, while two individuals to the right approach by land. Additional figures and colonnaded buildings appear in the background on either side of the main activity. The bright red border framing both the Silenus and the landscape scene has a rectangular panel with stucco imitation (white silhouettes on a blue background) inserted along the top. Parts of the white background of the wall are visible. 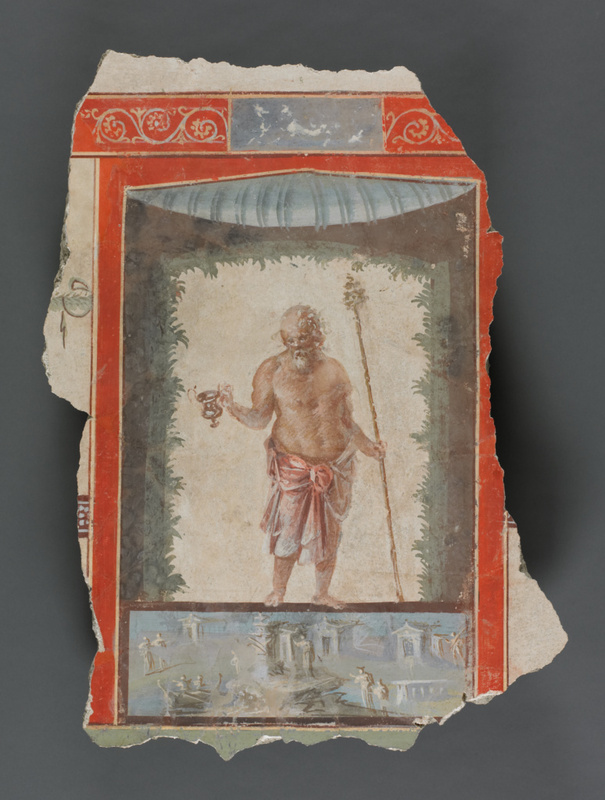 This fresco likely decorated a room in a Roman villa. Antike Kunst Palladion (Basel, Switzerland), sold to the J. Paul Getty Museum, 1983.